This post is sponsored by siggi’s. All opinions are my own. Thank you for supporting the brands that keep Lively Table running! I absolutely adore chicken salad. It’s one of my favorite lunches. But I am also very picky about my chicken salad. It can’t be too mayonnaise-y, and the chicken can’t be too chunky. So basically I just need to make it myself. And I always use yogurt in place of mayo to avoid an overpowering mayo taste. Because I just can’t with mayonnaise. I also love to switch up my chicken salad routine to include seasonal ingredients and fun flavors. Grape and walnut chicken salad? Yum. Avocado chicken salad? Sign me up! 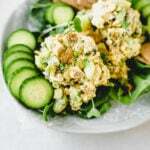 This coconut curry chicken salad is my newest twist on traditional chicken salad, and I could not be more in love with it. I love that it is made with simple ingredients, doesn’t have a lot of sugar, and is so easy to throw together. It is so good, y’all. I used siggi’s Icelandic-style coconut skyr as the base for the creamy curry sauce. The result is a perfect mayo-free chicken salad that is deliciously spiced, mildly sweet without too much sugar, and full of fresh herbs. 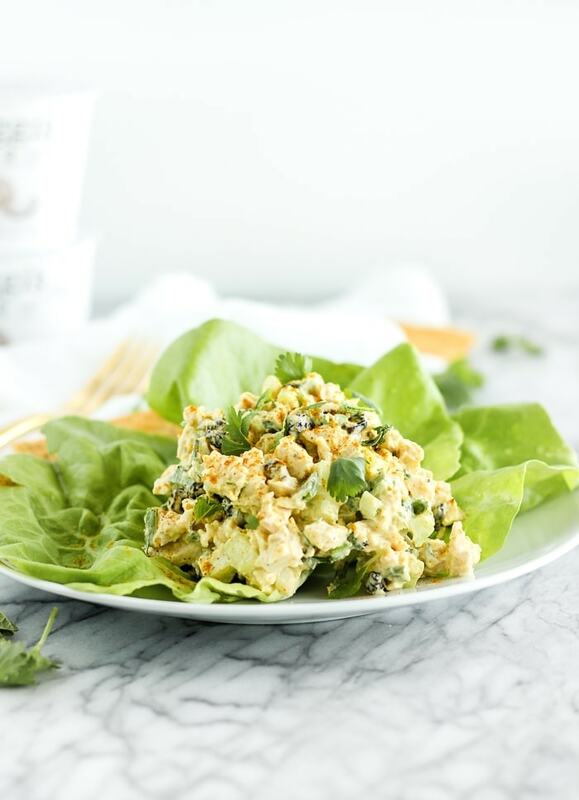 It’s such a fun, flavor-packed twist on regular chicken salad, and it’s loaded with protein for a filling and simple lunch time meal. 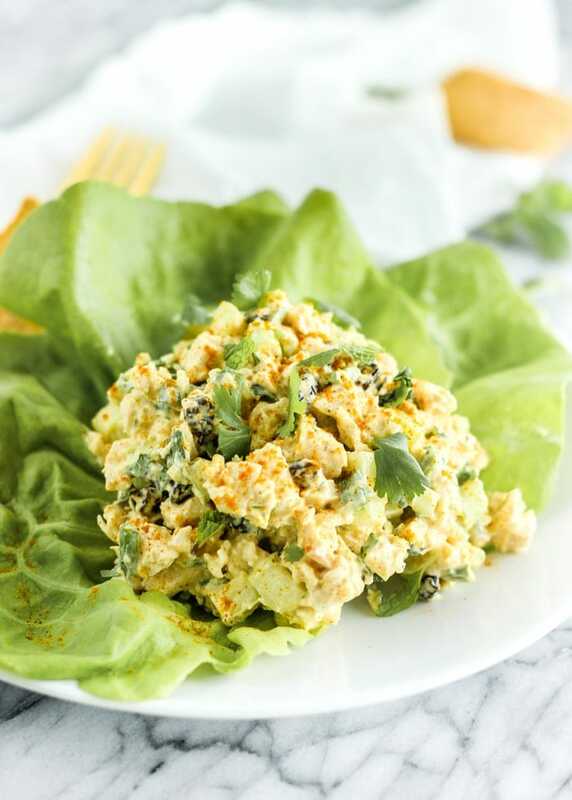 I love to eat this coconut curry chicken salad in butter lettuce cups with a side of whole grain crackers and fruit for a delicious balanced lunch, but it also makes a darn good chicken salad sandwich on your favorite whole grain bread. It’s so easy to prep on a weekend for a weeks worth of healthy lunches that will make you forget about going out for lunch. Instead, you’ll just be waiting for the minutes to pass, dreaming of eating this delightful mayo-free coconut curry chicken salad! 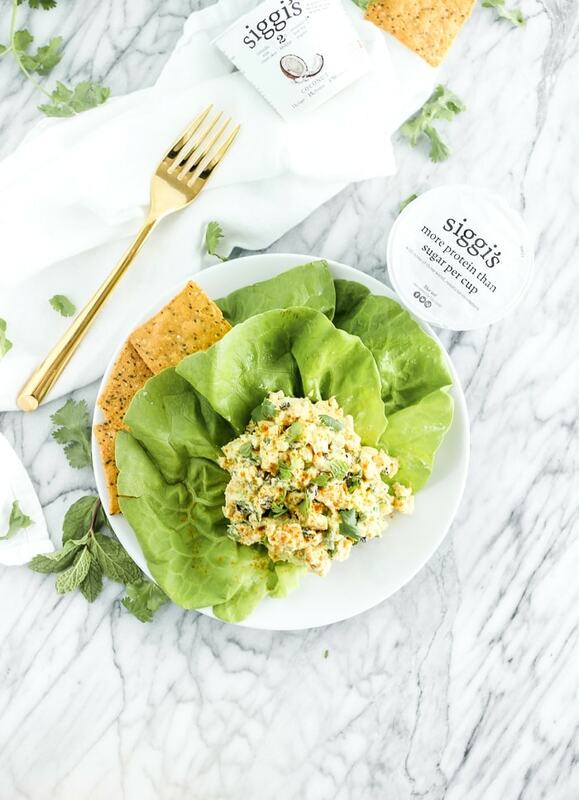 If you despise mayo but love chicken salad like me, you’ve got to make this mayo-free, lower sugar coconut curry chicken salad made with simple ingredients, like chicken, fresh herbs, and siggi’s coconut skyr, ASAP! I promise it’s going to be your new go-to chicken salad recipe. In a large bowl, combine chicken, celery, green onion, currants or raisins, cilantro and mint. In another bowl, whisk together skyr, curry powder, garlic powder, salt and pepper. Stir into chicken mixture until evenly coated. Serve on whole grain bread, lettuce cups, or with your favorite whole grain crackers. I really like curry chicken salad and this sounds delicious! Thanks, I’ve really been liking it for lunch!